Conveyor belt machines and equipment are designed to move (convey) product and other materials from one process to another. They can also be used to support the product or container while the product and container processing occurs. Conveyors can use different methods to convey products and materials. Conveyor machines for stable solid products or packages can use belts, rollers, side belts, or interlocking plastic plates, know as tabletop (Delron), to convey products. Side belt transfer conveyors are a special classification of conveyor for stable solid products. Side belt transfer conveyors use gripper belts that grip the side of the container to convey a container, thus leaving the bottom of the container exposed. Side belt transfer conveyors are often used during the coding or labeling of the bottom of the container. Laner conveyors or laning conveyors are used to transfer containers from one lane to multiple lanes or from multiple lanes to one lane. Laner conveyors are often used in conjunction with tabletop or roller conveyors.Screw conveyors are designed to conveyor powder. A large screw rotates within the product in a screw conveyor and the product moves forward with each progressive revolution of the screw. Vibratory conveyors use the vibrating action of a vibratory pan to move product forward. A bucket elevator is designed with buckets that raise free-flowing product, either powder or small solids, to a given height above the floor. The product is held in the buckets and once at the given height, the buckets are overturned and the product is dumped out of the buckets. Frazier & Son "Z" style Model C-WD, stainless steel, enclosed, wipe down, bucket elevator with product feed conveying system rated up to 45 feet belt speed and 8.3 cubic feet of product per minute or 500 cubic feet of product per hour, based on 75 % usable volume of type product being run. Stainless steel enclosed frame construction. 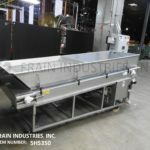 Equipped with 12" x 14" product load area has 24" in feed height with (84) model CBT-2, 14-1/2" long x 7" wide x 3-1/2" deep, dimpled opaque white polycarbonate product buckets with 63" long horizontal floor run to 163" vertical lift, to 98" overhead horizontal top run, with 163" product discharge height and interlock safety doors. Control panel has A/B panelview touch pad controller with belt and feeder speed control dials and start, stop, e-stop push buttons. Mounted on (4) height adjustable leveling legs. 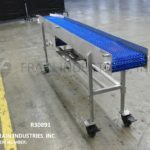 Product Feed Conveyors: Frazier & Son portable 108" long x 36" wide x 12" deep ID stainless steel dimpled inclined product feed conveyor with 92" long x 34" wide product feed belt and locking casters to 53" long 12" wide x 4" high ID Eriez stainless steel vibratory dimpled feeder into the bucket elevator. Stainless steel, 7" wide x 43" long conveyor. 7" wide and 43" long Intralox belt has an infeed / discharge height of 39". Equipped with a 1 Hp drive and mounted on (4) legs. Nercon, Stainless steel, 16" wide x 96" long conveyor. 16" wide and 96" long Intralox belt has an infeed / discharge height of 37". Equipped with a ½ Hp drive and mounted on (4) legs. Automatic, stainless steel, laner / pneumatic product diverter. Pneumatic product diverter has 4 1/2" lateral travel, 10 1/2" translation travel, and 1" horizontal travel. 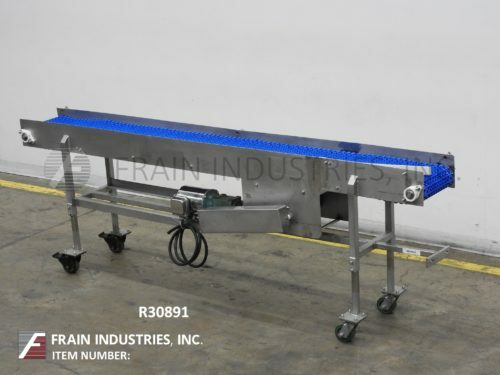 Has 79"L x 7 1/2"W tabletop conveyor, photoeyes for product presence, Parker compumotor controller, Mitsubishi variable frequency drive contoller, and barrier guarding with electrical interlock. Powered by 1/3hp Reliance Electric motor. Mounted on stainless steel frame with casters and height adjustable feet. Last dividing single lane of jars into two lanes.